Cami left to spend some time with friends the other evening so I had some fun with the children's sidewalk chalk. I've been wanting to do this for some time now. 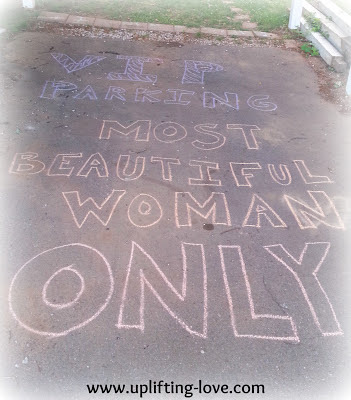 On the pavement in our carport I wrote in giant letters: "VIP Parking--Most Beautiful Woman Only." 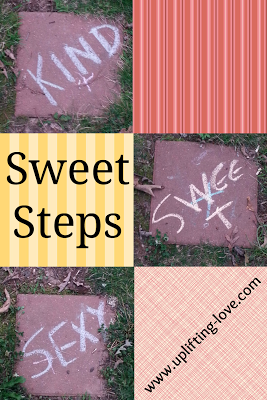 Then we have a walkway from our carport to our home that is a series of stepping stones. On each one I wrote a an adjective describing my beautiful wife. She loved it. :) Our sons thought it was pretty cool too. Our oldest wouldn't let his younger brothers even get close to it for days. He would tell them "don't walk on it! It's a special thing for momma." Adorable. While I did this for my wife it would work just as well for a husband. We like getting compliments too. If you haven't signed up for the Uplifting Love newsletter yet you're missing out. Do it now!